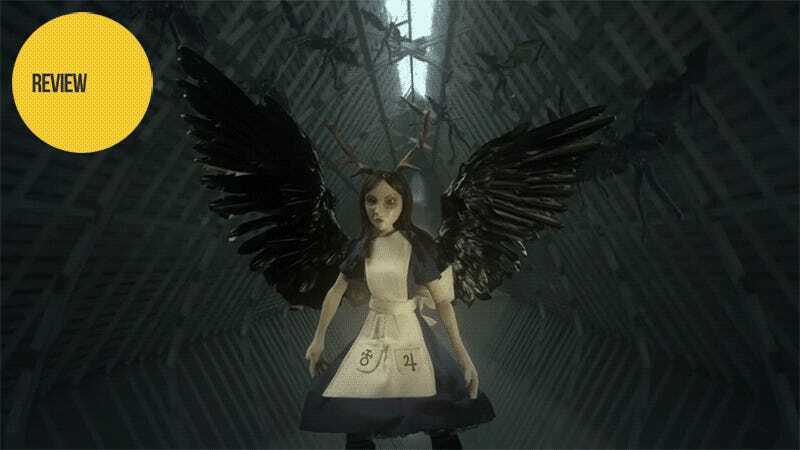 American McGee’s Alice is easily one of my favorite twisted re-imaginings of classic literature, so when I saw there was a Kickstarter for Alice short films, I pitched in without a second thought. However, even with my nostalgia turned up high, the final products are a mixed bag to say the least. The first short, Leviathan, shows an encounter between Alice and legendary author Jules Verne inside the latter’s own mind. As the two travel through the worlds of some of the author’s most famous titles—From the Earth to the Moon, Around the World in 80 Days, and 20,000 Leagues Under the Sea—they have a debate about the natures of science, inspiration, and the darkness to be found in the human heart. For an eight-minute short, Leviathan is absolutely packed with philosophical musings. Alice’s goal seems to be to get Verne to admit his greatest fear—mankind’s self-destruction via our own technology—and to understand how his visionary works could serve as either the inspiration to bring said fear to pass or to likewise prevent it. For Alice herself, there are a few nice character moments. Her dry, sarcastic, yet polite demeanor is intact but under her knowing smile is more than a bit of worry for the darkness she know lurks inside herself—as well as the hearts of all men. And while she has overcome some of her fears—i.e., fire—others continue to haunt her even asshe attempts to battle the darkness in any way she can. While the philosophical core is sound and the characters well-realized, the short is not without its problems. The animation style for Leviathan is CG, reminiscent of Rooster Teeth’s RWBY—though without the emotional range of expression or fluidity in movement. While a bit cheap-looking, the animation itself normally would be serviceable for a story where two characters do little more than stand around talking, if not for the sad fact that the lip flaps—i.e., the mouth movements—of the characters never seem to match up with the dialogue. It’s painfully distracting. When it comes down to it, the high point visually is simply getting to see Alice in various new costumes—including Astronaut Alice, Victorian Alice, Sailor Alice, and Steampunk Alice. The other problem of this short is Jules Verne’s confusingly thick French accent. His cadence and inflections are odd—almost as if a French person with no knowledge of English was reading the script phonetically. Moreover, over the course of Leviathan, Verne switches back and forth between French and English several times. Because of this, there are several lines in the film that I can’t understand (or even determine what language is being spoken) despite several watches. It’s even worse in the scenes with background guitar riffs that drown out the dialogue. In a film that lives or dies on its complex philosophical dialogue alone, it is imperative that your audience be able to understand every word that is uttered. If your viewer is fighting to figure out what exactly is being said, they are unable to focus on the ideas behind those words. The second short, A Night at the Opera, follows Alice as she is working backstage at an opera house—lamenting that she has yet to see an opera. Of course, despite the fact that Alice should have long since learned that no good comes from crawling through mysterious holes—be they rabbit holes or those in a diorama. Nonetheless, she does so only to find herself in Richard Wagner’s Norse mythology-inspired opera Die Walküre. Within moments her Omega necklace is stolen and Alice finds herself tasked with recovering it—and given antlers and a pair of black angel wings to aid in the task. But as with most things in Alice, those who claim to be helping her rarely are. Instead of focusing on philosophy like Leviathan, A Night at the Opera fills its runtime of five and a half minutes with a straightforward adventure. Alice fights monsters and little else. It is style over substance, but oh, what style. A Night at the Opera is stop-motion animated—a style which works perfectly in the creepy surreal world of Alice. The dolls—especially the skeletal dragon and Wotan—are as unsettling as they are captivating to look at. Add to this a dark color palate for the whole production and it’s pretty much exactly what I would dream a stop-motion Alice film to be. Alice Otherlands is an interesting experiment for the franchise—one with both successes and failures. While Leviathan has some complex musings, problems with its construction as a film distract from them. A Night at the Opera, on the other hand, has no deep message and instead shows us a simple yet tonally perfect Alice adventure. So while nowhere near perfect, I would absolutely be interested in watching further Alice shorts down the road. Alice Otherlands was released on October 30, 2015.